COOL! 8D! I love Japan. And Hayao Miyazaki films, ecspecially Spirited Away. HAYAO MIYAZAKI KICKS BUTTTTTT!!!!!!!!! I LOVE PRINCESS MONONOKE!!! Wowza, yay! Japan is so cool! She Who Must Not Be Named: I've heard of David Fermer! (Actually I've met him because he's friends with my former German teacher.) I haven't read "Rats," but I've read "Nonstop Fussball" and "Nonstop Survival," which are bilingual books. pfhhhisb, logic. I reject your reality and substitue it with my own. 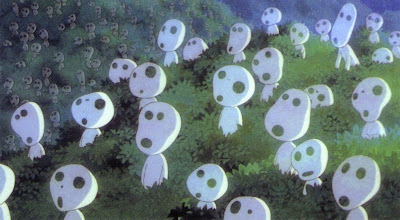 I totally love the movie "Princess Mononoke". 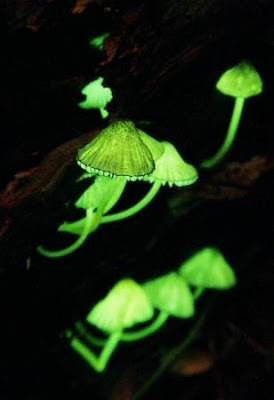 Plus those mushrooms are cute in a weird kind of way. Those mushroom spirits are so cute. =) I love Miyazaki movies. That is so cute! I'd love to go camping there. BTW: I have posted on my blog (finally), there are some photos of my cats if you would like to see.